"The Quest for Cosmic Boy: Lord of Lightning - Part 1 of 2"
Star Boy, Sun Boy and Mekt are on Winath, talking with Tenzil Kem, the special investigator from the United Planets. Threats are thrown around in various and sundry manner before they all head inside to the home of Mekt's parents... who seem to have disappeared in the middle of a meal. Star Boy calls temporary Legion headquarters looking for Supergirl for instructions on what to do next, but gets Brainiac 5 instead. Brainy tells him Kara is otherwise engaged at the moment, as video footage of her engaged in some sort of battle play on screens in the background. Brainy says he has no idea what happened to Mekt's parents, but advises Star Boy to not let Kem get the better of him. As a famous Winath electrical storm approaches, the group head into one of the many underground complexes that the population of Winath built to stay sheltered from the storms. These complexes are so advanced that they can even harvest their surface crops from down there, although the entire complex seems to be deserted... until Kem finds what appears to be some sort of graffiti that says "Validus". Mekt accuses Kem of planting the graffiti, since he knows so much about everyone, and Mekt and Sun Boy get into a fight as tempers flare. Star Boy collapses them both and calms them down, and then Mekt explains that he is odd among his people... a solo birth as opposed to twins. He was shunned and feared, because "solos were usually self-destructive". Apparently the people of Winath think all solos have a supernatural death wish, because they are a superstitious people. When the first settlers came to Winath, the fierce electrical storms claimed so many lives that they blamed it on an evil spirit storm god named Validus. A cult sprang up around Validus, and they approached Mekt, believing him to be part of a prophecy that would bring Validus to Wintath in the flesh. Just wanting a place to belong, Mekt joined them. They sent Mekt to find Validus on planet Korbath, but Garth and Ayla stowed away aboard his ship, and when the accident happened that gave Mekt his powers, Garth and Ayla got powers too (thus becoming Lightning Lad and Light Lass). But Mekt's siblings getting powers wasn't part of the prophesy, so the cult abandoned him. Mekt says he knows for certain that the cult is long gone, so the graffiti must be a hoax. Kem, meanwhile, has been exploring the underground complex and finds two children, who lead him to a room and say they'll get the mayor from the hidden hiding place, and then lock him in a room and begin to fill it with grain from the surface, which Kem is quickly buried in. Star Boy, Sun Boy and Mekt, meanwhile, find more people in the complex, including Mekt's parents... only their eyes are glowing and they say Mekt must be punished because the Lord of Lightning demands it. Story - 4: It feels to me like this story is already kicking into high gear and, if played right, "The Quest for Cosmic Boy" could be a grand adventure that is enjoyable in every sense of the word. This issue was incredibly light on Kara, for those of you looking for your Super-fix, as she only appears on video monitors in the background of two panels. I did enjoy the change of pace in getting an entire issue focused just on one group of characters, though, which gave them more time for development and depth (although this only really happens for Mekt, but it's good stuff). I'd have liked a bit more development for Star Boy or Sun Boy, both of whom I still feel like I don't really know as characters, but I can see why Mekt got the development over them if it ties into the overall story in the quest for Cosmic Boy better. This is going to be the shortest review I've written in some time, because honestly I've not got much else to say. It was a solid story with a good cliffhanger ending and I enjoyed it thoroughly. My only concern is that I hope the "Lord of Lightning" story actually ties into the overall "Quest" story more than just being a detour about what happened to one of the teams looking for Cos along the way. At this point, though, I've nothing to complain about... except maybe more Kara would be nice, but hey, it's a team book and she can't star in every issue. I just feel like a well-written Kara is at a premium these days, so I'll take all I can get. Legion is still holding up as the consistently best-written DC book I'm reading right now. Huzzah. Art - 5: I'm not familiar with Mr. Calero. Why is this? There's a realism to his art that I absolutely love... likely as realistic as you can get with traditional comic art (without going into full-fledged painting like Alex Ross, for example). The opening splash with Cosmic Boy actually made me pause and stare... the first page of the book, and I had no idea who this guy was, and I was already blown away. The best word I can use to describe it is flawless. I would LOVE to see this guy on Superman or Action Comics. Just totally awesome stuff. His faces are distinctive and the expressions are great, too. ...except for the top panel on page 10. Are we seeing the split-second Sun Boy had an aneurysm? That is one freaky expression, folks. You'd swear his brain just melted out his ear. But one expression that's slightly off, in an entire book which is otherwise pure gold? I'll take it any day of the week. Cover Art - 4: Mr. Calero, that is some awesome work there. 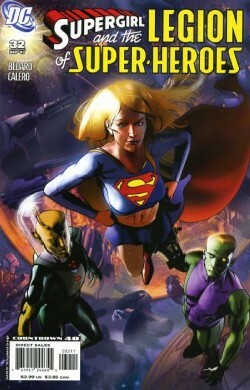 But Supergirl really isn't in this issue... and Chameleon isn't even in the same galaxy as this issue. What the heck? Regardless, Kara looks fantastic here, even if the poses and background are rather generic.